Jayson [L.], 34, of Deltona used a sword to break down a door and threw kitchen knives at family members after his mother's boyfriend accused him of taking a can of shrimp, according to the Volusia County Sheriff's Office. [He] told deputies he didn't remember everything that happened during the fight because he "went into code red and lost his temper," the report said. When most of us hear "code red," we probably think of A Few Good Men, the gripping drama about the death of a soldier who was brutally disciplined for taking a can of shrimp (or something, saw it a long time ago). In the film it refers to an order for extrajudicial punishment (again, this was back when that was illegal), but there is no standard list of codes. Which can be a problem, as this Wikipedia article suggests. 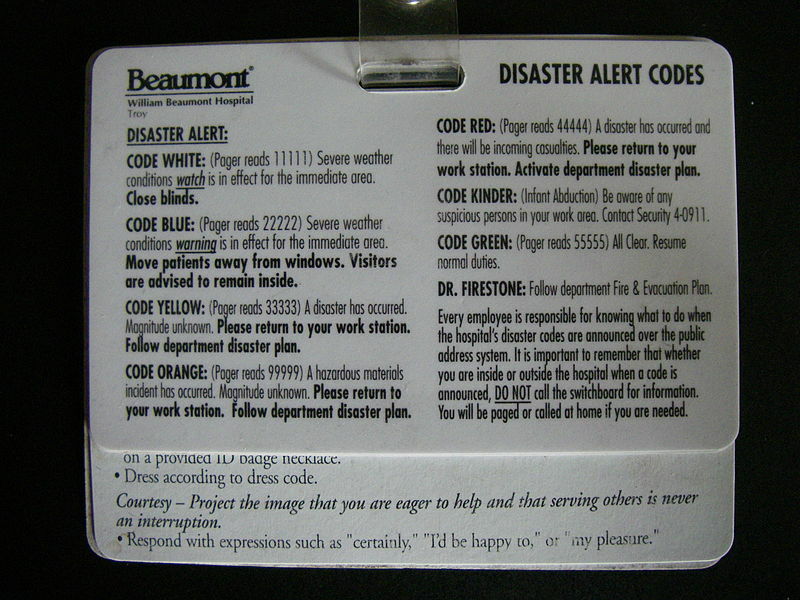 For example, "Code Blue" is familiar from medical dramas as code for a patient in a medical crisis, but as the image shows, at one hospital it apparently means "tornado" at least in some circumstances. (We can assume there's a different code for "medical crisis" there, so if you hear "Code Blue" and they take you to the basement, don't get too worried.) Similarly, "Code Red" often means "fire," but according to this it means "a disaster has occurred and there will be incoming casualties." Which is sort of how it was used in Volusia County, I guess. According to the report, the disastrous missing-shrimp accusation first led to a "heated verbal argument" and then an agreement to step outside for the infliction of at least one casualty. There, the younger man "threatened [the other] with a statue," but the fight outside did not escalate any further. In fact, the mother's boyfriend believed the fight was over, and returned to their bedroom. The couple was watching television when [L.] started breaking through the bedroom door with a Samurai style metal sword, the report said. Seems it wasn't quite over. Once inside the bedroom, [he] made threats that he would use the sword to hurt [the boyfriend], deputies say. The couple was able to calm [him] down and he left the room, but returned almost immediately and started throwing  kitchen knives …, deputies said. The boyfriend was able to escape through another door, so no one was injured. Based on this evidence, I'd say the assailant wasn't really serious about hurting anyone, or maybe he's just never assailed anyone before. First, he had his target outside and unarmed, while he was wielding a concrete statue. (Sadly, I was unable to learn what kind, though it must have been small. Garden gnome? Virgin Mary? Lawn jockey? Could the answer not be funny?) Yet no escalation. Second, breaking through a door like a ninja is fairly impressive, but if you're holding a sword you don't need to also "make threats that you will use the sword to hurt" whoever you're pointing it at. Pointing the sword basically says that already. And then kitchen knives are not the experienced ninja's weapon of choice, I don't think. All of which is to say that I'd accept this as evidence he lacked the intent to kill. Police seem to have done so too; he's only been charged with aggravated assault, not attempted murder. They also haven't charged him with stealing shrimp, so I assume that mystery will also remain unsolved.